I review here not H. P. Lovecraft's uniquely outre, macabre, and fascinating body of work, but a particular edition: H. P. Lovecraft: The Complete Fiction, published by Barnes & Noble in 2011. It's a handsome leatherbound volume, but it's the completeness and integrity of the text to which I draw your attention. First, this brings together all of Lovecraft's fiction (he lived 1890-1937). You would need all the Arkham House standard fiction collections, or a motley assortment of other grab-bag collections, to have most of these stories — not all of them. Second, for any and all stories, you'll want the texts as subjected to the careful scholarship of S. T. Joshi, so you may read what Lovecraft actually wrote. As Lovecraft's style is deliberately archaic in varying degrees, and his stories originally were published mostly in pulp or fan magazines with plentiful transcription errors, this is quite an achievement. Third, you'll want the 2011 or later printing, which fixes the regiment of typographical errors inserted into Barnes & Noble's predecessor edition, H. P. Lovecraft: The Fiction of 2008 — discovered by the keen eye of Martin Andersson. The Complete Fiction has a judicious introduction by the leading Lovecraft scholar and biographer, S. T. Joshi: worth reading even if you already are familiar with Lovecraft. Joshi also contributes a one-paragraph introduction for each story, with its writing and first-publication data. 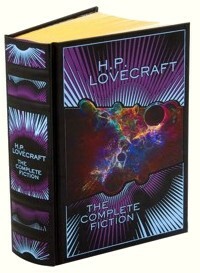 The stories themselves range from homely-haunted Arkham to weirdly-denizened spacetimes, from snippets like "History of the Necronomicon" (styled as an essay, but really — ); through classic stories and novellas like my old favorite "The Shadow Over Innsmouth"; to the short novels, the fabulous The Dream-Quest of Unknown Kadath, the alchemical thriller The Case of Charles Dexter Ward, and the cold Antarctic revelation At the Mountains of Madness. The collection wraps up with Lovecraft's famous analytic survey, "Supernatural Horror in Literature". A full contents list, with linked information for each story, can be found at The H. P. Lovecraft Archive for H. P. Lovecraft: The Complete Fiction — annotated contents. A fine edition. Get this one.